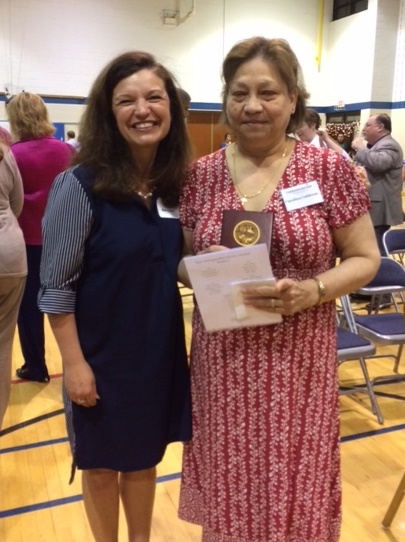 Carolina Calderon (with Cornerstones’ Board Chair Jill Norcross) receives the 31st Annual Herndon Mayor’s Volunteer Appreciation Award for Distinguished Service. It is always heartwarming when those who were once on the receiving end of assistance at Cornerstones come back to volunteer and support their community in any way they can. Such a volunteer is Carolina Calderon who first learned of Cornerstones when she was in need of help a few years ago. While Carolina was being assisted through the Herndon Neighborhood Resource Center (HNRC), she decided to become a volunteer herself. For the past five years Carolina has been one of the most dedicated and reliable volunteers at Cornerstones, providing over 280 hours of her time last year to ensure the English classes at HNRC ran smoothly and assisting staff at the Cornerstones food pantry. Carolina’s most outstanding qualifications are her commitment, her compassion and her work ethic. Appreciating how those newly arrived to the U.S. often come from countries without the services offered by the HNRC and, due to cultural reasons, may be hesitant to seek help, Carolina always makes sure clients feel welcomed and informed. Leading by example, Carolina shows clients that accepting assistance does not mean a loss of self-respect; rather, it builds a bridge to a more self-sufficient life. She encourages families and individuals to become involved in their local community and develop a sense of responsibility for the well-being of their neighbors. Carolina’s commitment to her volunteer service is sacrificial in nature. She does not have her own transportation, so twice a week Carolina walks two miles each way to get to the HNRC and three days a week she walks another two miles back and forth to assist the staff at the Cornerstones’ food pantry. The fact that Carolina walks 20+ miles a week, even in awful weather, is a great testament to both those she serves and those who serve alongside her. Carolina’s commitment shows she can truly empathize with people who are going through difficult times, and that even those with only time to give can be extraordinarily generous. “Carolina’s kindness and touch to others is like the touch of a flower. She likes to be productive and useful and she is making a difference in the lives of others.” Minnie Orozco, Program Manager, Cornerstones’ Food Pantry.